Artist-friendly music finance company Sound Royalties will be joining forces with Transparence Entertainment Group for one of ASCAP’s I Create Expo panels. Taking place on May 7 at Loews Hollywood Hotel from 1:15pm – 2:15pm, the panel titled “Your Music, Your Money: Shedding Light on Royalty Financing & Your Global Rights” will inform artists how to properly register their work to maximize and collect royalties worldwide and how to leverage royalty funding techniques. Sound Royalties, a finance company specializing in the music industry, announced today that the company is co-hosting one of the featured panels during the 2018 ASCAP I Create Expo. 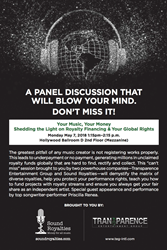 Titled “Your Music, Your Money: Shedding the Light on Royalty Financing & Your Global Rights,” the panel will take place on Monday, May 7 from 1:15pm – 2:15pm in Hollywood Ballroom D at the Loews Hollywood Hotel in Los Angeles, California. The panel will feature a guest appearance and performance by top songwriter-performer Priscilla Renea, who has previously written songs for the likes of Pitbull, Fifth Harmony, Miranda Lambert and more. Sound Royalties recently worked with Renea to help fund her creative projects that included releasing her new album & tour. Comprised of seasoned music finance veterans, the panel will deliver an informative discussion for artists and creatives to learn how to properly register their work and claim global royalty funds. In collaboration with Transparence Entertainment Group, Sound Royalties’ presentation will break down the complexities of diverse royalties, provide detailed information on how to protect creatives’ rights, teach creatives how to fund future projects with royalty streams and more. Sound Royalties innovatively transforms the way that music professionals fund their creativity. The company aims to fill the music industry’s financing void with offerings built around the needs of music professionals with fast, non-credit based funding. Founded by CEO Alex Heiche, Sound Royalties, LLC is a privately-owned specialty finance firm that helps music industry professionals fund personal and professional projects while allowing them to retain the rights to their music and royalties. The company's core business is offering royalty advances of anywhere from $5,000 to $10 million, without having to deal with credit issues, while preserving all rights to the artist's music. It does this by advancing artist royalties paid through music labels and performance royalties paid through Sound Exchange. To date, Sound Royalties, LLC has worked with a wide range of leading music industry professionals, including GRAMMY Award winners, platinum recording artists and notable music industry executives in every genre. Learn more at https://www.soundroyalties.com.